The kingdom of Birpur was under constant threat from its enemies. The king ordered his subjects to move into the nearby forest for safety. All the people moved into the forest, except for Sobha Singh’s family. "Nothing will happen; the king is worried for no reason!" said Sobha Singh to his two sons and his clever daughter, Bhanumati. One evening, the soldiers arrested Shoba Singh for disobeying the king. At that time, Bhanumati was away collecting wood. When she returned, her brothers told her what had happened. "Alas! Father should have obeyed the king," she said, and began to cry. Her brothers consoled her and said, "Don't worry, dear! We will do whatever is necessary to get Father realized." Then, asking her to prepare dinner, the two brothers sat down to discuss their plan. Bhanumati overheard them from the kitchen window. “Tonight we shall sharpen our weapons," said one of the brothers. "Hmm! Let's start early tomorrow morning," nodded the other. We will capture the king and force him to release Father. If he refuses, we will kill the king and take our revenge." On hearing this, Bhanumati was alarmed. "My father made a mistake by disobeying the king, and now my brothers are making another one. Our king is a wise and kind man; it would be crazy to kill him. I must do something to save him," thought the young girl. She waited patiently through the night. Early morning, as soon as her brothers left, Biannulate left too, but she took a shorter route. "I must make it to the place before my brothers do," she thought. Braving the thorns, she reached the place. The guard at the gate stopped her and asked, "Where are you going?" "Please let me in! I need to see the king urgently," said Bhanumati." come in the evening," said the guard in a stern voice. "It will be too late! Please allow me to meet hi now!" Bhanumati pleaded. The guard stood firm, blocking her way. But she dodged between his spear and the doorframe, and entered the palace. "Wait!" the guard shouted, running after her. Bhanumati ran past the gallery and into the court. Just then, the guard caught up with her.” What is all this?" asked the king, angrily. "Forgive me, Your Majesty!" Biannulate said, gasping. "This is urgent!" “Who are you?" asked the king. “I am Bhanumati, the daughter of Sobha Singh, who has been imprisoned by you," replied the girl. "My brothers are coming here to abduct you and they plan to kill you if you do not agree to release my father." The king was shocked to hear all this. More so, because the girl had come running all the way only to warn the king against her own brothers. "Do you know the consequences of telling me about your brother's plot?" asked the king. "I can arrest them and execute them along with your father." "I know, Your Majesty!" Bhanumati said softly. “But your life is more precious to the kingdom and its people than the lives of my father and brothers." Just then the soldiers brought in Bhanumati's brothers. "They were trying to get into the palace by force, Your Majesty!" said the soldiers. 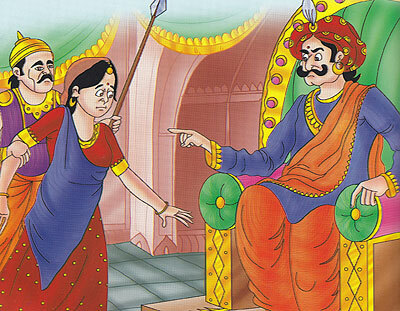 The king was very impressed with Bhanumati, and said, "Ask me for any reward, brave girl, and I will give it!" he said. "Please free my father and my brothers, Your Majesty!" Bhanumati pleaded. The king granted her wish and released Sobha Singh and the brothers with a warning. Thus, because of her intelligence, Bhanumati saved the king as well as her family.